I hate to rush from one holiday to another, but it’s time for me to start thinking about Valentine’s Day. With two of my kids having birthdays that week (one is actually on Valentine’s Day and the other is on the 16th) and lots of class parties, that is a busy time. So the more I can do to prepare now, the better off I’ll be then. I was totally inspired by this beautiful card made by Barbara Anders. 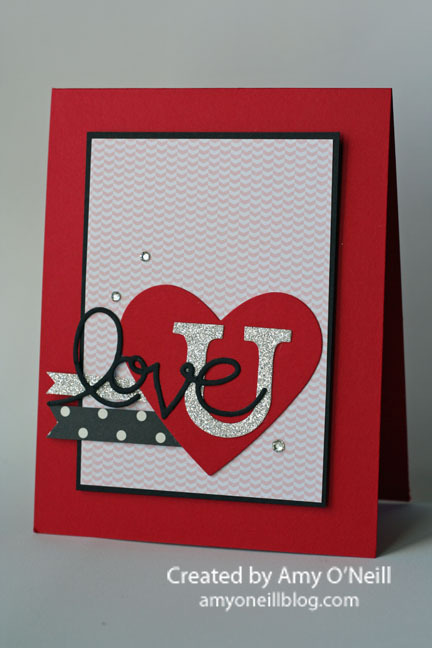 I cased her layout and used different products and colors for my card. 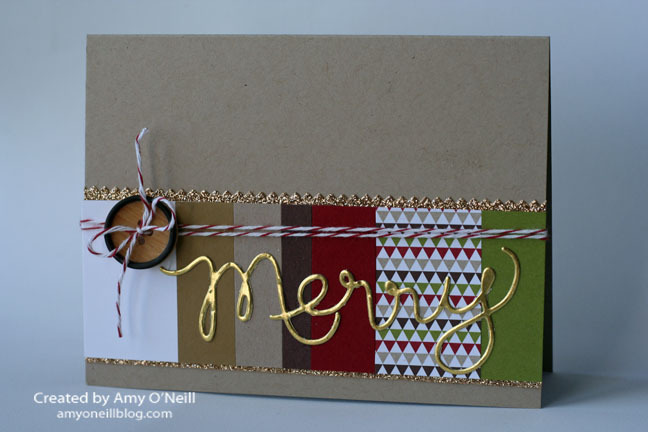 Here’s a simple Christmas card that is great for using up scraps. I took the color scheme from the Season of Style dsp pack, and added some gold foil paper and champagne glimmer paper. Easy peasy! 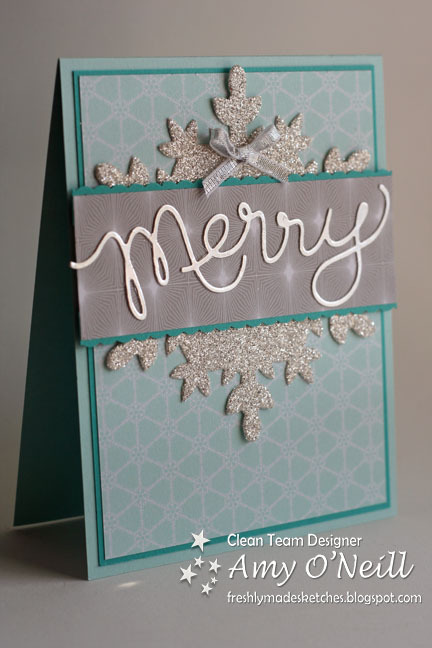 I just got the Festive Flurry bundle yesterday (resistance was futile), so I decided to break it out and use the snowflake die for the circle shape in the sketch. I hope you’ll join us for this challenge. You can check out what the other designers made at the Freshly Made Sketches site here. In other news, my Mother-in-Law is getting out of the hospital tomorrow. She is slowly recovering from her broken hip. My brother-in-law from New York is staying with her this next week, so she’ll have someone with her. I tell you, a broken hip looks like a very painful injury — wouldn’t wish it on anyone! We bought a new (used) car yesterday to replace the one my husband totaled in his accident on the way to the hospital for my MIL’s surgery last week. It’s nice to have that off my plate — shopping for a car takes a lot of time. I’m ready to have some regular time for stamping again! 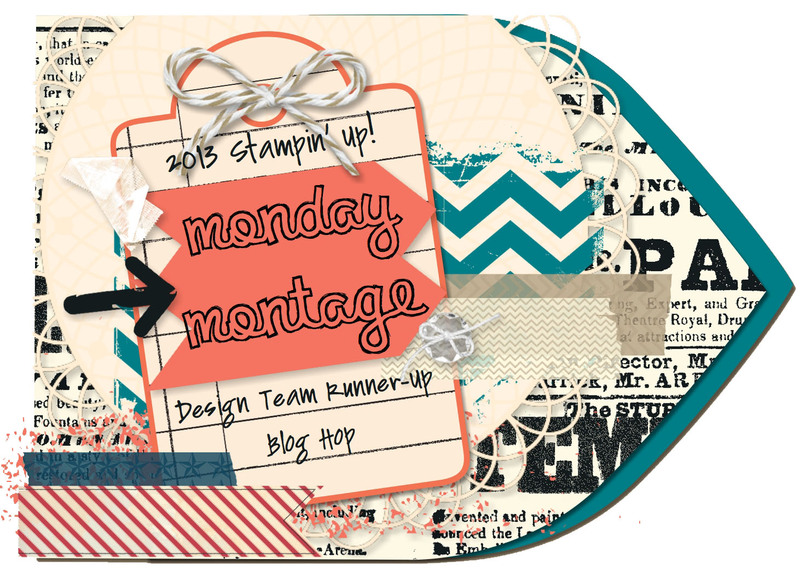 Welcome to our first Monday Montage! We had so much fun doing the Artisan Finalist Blog Hop that we decided we should get together a couple times a month and do more blog hops. So the ten of us who were finalists for Stampin’ Up’s Artisan Award, but not chosen for the design team, will be showing you various projects together. 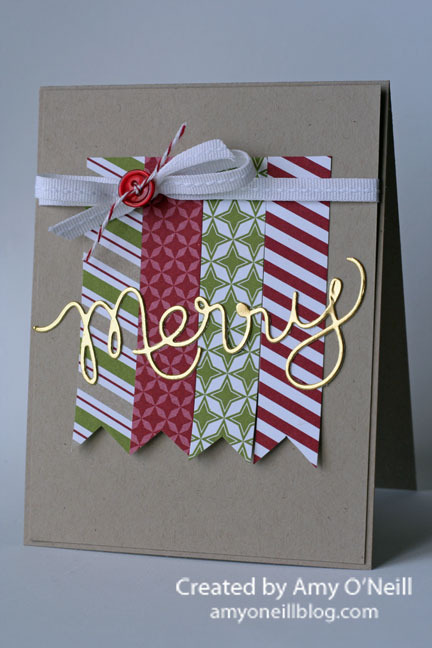 I also used the new Gold Foil Sheets to cut out the “Merry”. Isn’t that stuff beautiful! I hope you’ll continue on the blog hop and go check out Breelin Renwick’s beautiful creation. You can also work your way backwards by starting with the talented Wendy Weixler’s blog. Either way, just make sure you work your way fully around the blog hop circle.